Wights, often called vættir in Heathenry and many names elsewhere, come in varying shapes and sizes, temperaments, and expectations, though they often share some characteristics. These beings are frequently seen as nature spirits. According to Grimm in Teutonic Mythology Vol II, wights are semi-deified, often described as physically smaller in stature than man and typically disfigured. Wights are seen more often in folklore and tales, and less so in historical accounts; though it is not unheard of, especially Icelandic accounts (Egil’s saga, for instance). Some are more social while others were more solitary. They have the ability to help or hurt men and turn invisible at will. They often have superhuman abilities, skills or magic. They can use these abilities to either help or harm the humans near them. This is often seen once again more in folklore. Húsvættir are wights of the home, while landvættir are wights of the land. 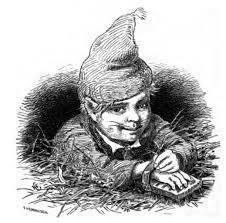 Vættir include but are not limited to things such as elves, brownies, tomte, trolls and the like. While often helpful around the homestead this is not always the case. Many accounts of dead livestock or stolen/missing children have been attributed to disgruntled wights. There are things that are thought to upset wights. Some of these are local custom some farther reaching. In Sweden it was thought rude to not say “look out” when throwing out hot water or urinating, the thought being that wights are invisible and this would give them a chance to move so they don’t get wet. Iceland had a law banning dragon headed ships, for fear it might frighten or upset the local land wights. Wights, elves especially, are said to live in stones and it has been suggested before moving stones or doing any major landscaping to give the wights ample warning so they can move to a new location. This is still believed to be the case in Iceland, to the point that construction projects will go out of the way to avoid disturbing stones thought to be elf homes. A gift cycle of sorts appears to have been regularly engaged in with some level of expectation from both sides; humans would leave the wights offerings typically of food and the wights wouldn’t cause trouble, and perhaps might even help with things around the home/farm. Being polite was and certainly is still considered good form. The offerings varied from region to region. Some wights seemed fond of porridge with butter on top, others would take what food was politely given. Sometimes offerings were made in a special place or on a special occasions, while other times it seemed a regular part of a gifting cycle. Now one may say “But I don’t live in Iceland, Sweden, Denmark, etc. How do I interact with the wights in and around my home?” Good question: the arch-Heathen seemed to be of the belief that whether or not humans were in an area wights could and likely would be. Taking into account the fact that animism is widespread throughout the world as well, in that most cultures had land spirits even if they called then something else. Acknowledging both of those points, a logical step seems to be that no matter where you live wights do too. How then does one interact with them? In a single word: respectfully. Perhaps start and maintain a gifting cycle, acknowledging their presence. In general treat them as you would a guest. If you find one offering doesn’t work (porridge for example) try another. When you find a formula for interacting with them that works you may simply to stick with that. How will you know it’s working? In folklore when the gifting cycle was successful and the wights content, animals would be healthier, farms and homes would flourish. The opposite was also shown to be true. When the wights were disgruntled animals could be struck by strange sicknesses or death, fields would not produce crops, things may go missing. While most of us don’t live on farms the same type of things can be seen. House plants or gardens thriving or dying, pets becoming sick or injured, items going missing, especially ones of sentimental import. The arch-Heathens had a great deal of respect for the world around them, believing that the land wights should be cherished and properly treated. When we apply this to our modern worldview, we begin to notice the result of that respect having faded over the centuries. When we begin to respect the wights in and among our home, we better respect the home itself, and the land it is on. We can only benefit from that reverence, much as we hope the vættir, and the land itself, benefit from it.